Torch Lighting Ceremony and Free Hula Show at Waikiki Beach. I used to watch the Hawaiian tiki torch lighting ceremony and free hula show from the water while I was out surfing. That’s not the best seat to see this fun Hawaii attraction, but I was having my own good time regardless. 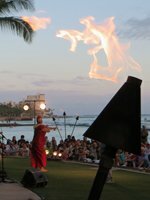 The torch lighting ceremony and free hula show is an hour-long performance held year-round, every Tuesday, Thursday and Saturday (weather permitting). 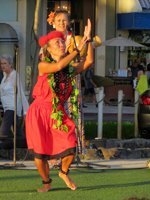 And in addition to seeing everything promised in the name, the various elements of the performance are tied together with some popular Hawaiian songs and a lighthearted narrative about Hawaii history and Hawaii culture. It's a little corny, but it will probably still make you laugh. It's fun... and that's what you want on a Hawaii vacation. For starters, the torch lighting ceremony itself is really a rather brief portion of the overall performance. 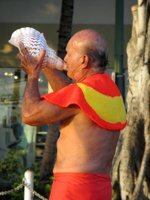 The commencement is announced with the blowing of trumpet-like fanfare on a Hawaiian conch shell. Then a man costumed in a traditional Hawaiian ceremonial cape wades through the crowd and lights the torches around the edge of the beachfront dais. From that point forward, it’s basically songs, anecdotes, and the free hula show. 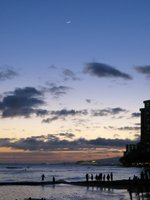 Honestly, I believe this bit of free Waikiki entertainment is one of the true, value-added experiences that can make your Hawaii vacation special. 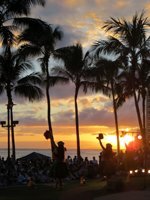 I’ve been to a lot of beaches around the world, and not a single one of them had a free hula show and torch lighting ceremony. 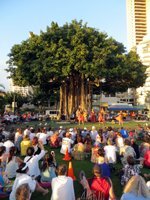 And this is just one of many free things to do in Waikiki! Click here to see an updated schedule of performances (link opens a new window/tab). That said… the overall quality of the performance isn’t quite the same as the dancing and music I’ve become used to at world-class hula competitions, nor even at the paid-entrance luaus. Nevertheless, it is free; and it is right on Waikiki Beach; and the crowd seems to really enjoy it! Those factors alone make it awesome! So don’t let me deflate your opinion of it just because I’ve heard all the corny jokes before and I happen to be friends with some fantastic hula instructors and competitors. Basically, everything was as good as it gets anywhere; and everybody on the beach knew it. Even as twilight faded into darkness, the beach was still packed with people, and most of them hadn’t even gotten out of the water yet! Getting to watch a free hula show and torch lighting ceremony in addition to all of that was just icing on an already glorious cake! By the way… my friend Steve would like everybody to know that his dad invented those tiki torches (he only told me 100 times).